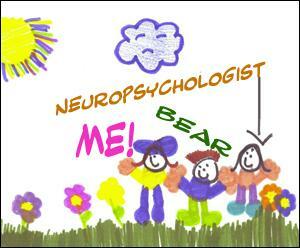 Today Bear had his appointment with the neuropsychologist. As we hadn’t received a letter about this rendezvous I rang the hospital yesterday to find out if we had to present ourselves at the ‘bureau d’admissions’ first since we’d been told to do this at the last outpatient consultation. The lady on the phone didn’t seem to know so she gave me some Mozart to listen to while she made enquiries. About 50 bars of music later she returned. “Yes, you do need to come here first.” she assured me. We duly waited our turn behind two other people only to be told that we should go straight to ‘tests de memoire’. We followed the directions, took the lift to the first floor and came to another waiting area where a group of three people were chatting. “Excuse me please, do we have to see a receptionist on arrival?” I asked the lady nearest me. “No, they just call you in.” was her response. They continued chatting but when they mentioned the doctor it was not the one we were due to see. “Do you know if this is right for Dr. G? “ I asked. There were voices coming from the room marked ‘consultations’ and the door was open so I tapped and enquired. “Yes, you’re in the right place.” was the response. Sure enough, at precisely 14.00 a door opened and a young man came forward to ask for us. I could sense Bear’s lack of confidence in him immediately. He invited us in but when he realised he was going to have to cope with someone who was reluctant to speak French he seemed a bit taken aback. “Some of the tests are a bit complicated. Oh well, we’ll have to do the best we can and avoid the verbal ones where possible.”. First of all he showed us a series of 25 pictures – small modern art type drawings – and said Bear had to try to remember them for later. Bear made it clear he wasn’t going to take it seriously. He was joking about ‘what 7 year old child could have drawn this rubbish’ and he kept turning round to make comments to me instead of studying the pictures. So it was not surprising that when the time came to pick out the ones he had seen when they were presented to him in groups of four – only one of which he had been shown before – he didn’t score very well. Mind you there were one or two that I wasn’t sure about either! He was asked to copy a geometrical drawing to the best of his ability, but he didn’t try very hard. After some other tests involving copying hand movements he was asked to draw the same picture again from memory. He made a mess of that. “I get the impression he doesn’ t really want to do these tests” said the young doctor. Then he produced a board with about fifteen blue cubes stuck on in a random pattern.and asked Bear to touch them in the same order that he did. He managed quite well until it came to five at a time. Then the Doctor said he wanted him to touch them in reverse order. Bear did two and three with no problem but once it got to four he gave up trying. This doctor had not been given the results of the MRI scan Bear had done a couple of weeks ago but he asked about them at the office when he saw us out. The secretary produced the envelope and Dr G had a quick look through. “Ah, Dr T. will explain all this to you when you see her on February 6th”, were his parting words. It’s difficult to know who was the more relieved to say goodbye – Bear or the young doctor. The new washing machine arrived this mornng. While trying to clean the corner of the laundry room yesterday I couldn’t turn off the water tap to remove the old machine so I asked Bear if he could do it sometime. A few hours later I looked in and found a large puddle on the floor. Yes, Bear had been playing with the tap and left it dripping. Anyway, we were all ready for the new arrival and the van turned up at 9.30 with two very helpful chaps who took the old machine away and installed the new one. 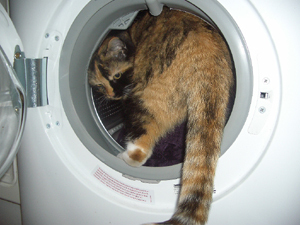 Of course, I found a load of washing and tried it out . It was so much quieter but took rather longer than I was used to. I’ll try the 45 minute wash next time. After lunch Bear decided he wanted to go and buy some cable but wouldn’t say what for. He asked if I wanted to go with him. I didn’t, but as he’s been quite pleasant recently I said I would. Needless to say I regretted it when he produced a leaflet for Conforama (my least favourite shop). He realised that he’d have to converse – in French – so he thought better of it and drove to Carrefour. We found his wire and put a few more bits and pieces in the trolley, he chose a quiche because he wanted ‘something nice’ instead of the usual fare and then he led the way back towards the electrical department. “I want one that will record from video to DVD and from the television.”. At this point he went into a strop – like an oversized two year old in a tantrum – and we had a short, sharp row in the middle of the aisle. And off he went towards the checkout, muttering and spluttering to himself at the injustice of it all.